Speaking of the aforementioned color usage (previously only utilized in the Thrizzle collected edition) the monochromatic color spectrum of this issue does much to amp up Kupperman’s retro comic leanings. The limited color palette recalls the ten-cent adventures of the Sheena, Queen of the Jungle adventure comics of the 1950’s. Sheena certainly had her share of ferocious obstacles to overcome, but did she ever have to juggle her duties of the jungle with the responsibilities of a fashion magazine publishing empire like Jungle Princess does? I think not! Thrizzle can always be counted on to have its share of hilarious alternate universe advertisers and this newest issue does not disappoint. Who hasn’t, at one time in their lives, wanted to be a filthy Cockney grave robber? 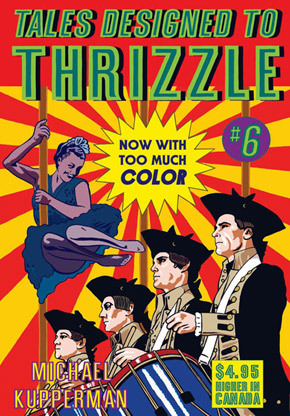 Many more meta-funnies are found within the pages of Thrizzle #6, but the issue ends on an action packed note via the sci-fi adventure So Boldly We Dare starring the crime solving duo of Mark Twain and Albert Einstein. How would Armageddon have played out if it was written by, oh, I don’t know, let’s just say Monty Python? Still, through all their trials and tribulations, Twain and Einstein’s mission ends on a positive note with the death via shuttle crushing of Domino director Tony Scott. Though Tales Designed To Thrizzle (brought to us by my favorite publisher Fantagraphics) is certainly a humor comic, it may in fact be the most original title being published today regardless of genre. Michael Kupperman is widely hailed as a comedic genus and this comic book’s influence goes far beyond the world of sequential art. Found out why this book is the one read by comedy greats such as Patton Oswalt and the writers for Conan O’Brien and pick up Tales Designed To Thrizzle #6 today. Hell, why not just pick up the whole run of the title up to this point, and at at special price to boot! And if anyone says they don’t get this kind of humor you just grab them by the collar, rough ’em up but good, and tell ’em Twain and Einstein sent ya.